Repeal Certificate of Public Need laws. We want to see a lot less government involvement in medical care. Government involvement has driven costs sky-high, making it impossible for most people to pay out of pocket for their care. (In the past, a much higher percentage of health care costs were paid out of pocket.) A free market would be a big improvement. Unfortunately, the General Assembly keeps moving in the opposite direction. 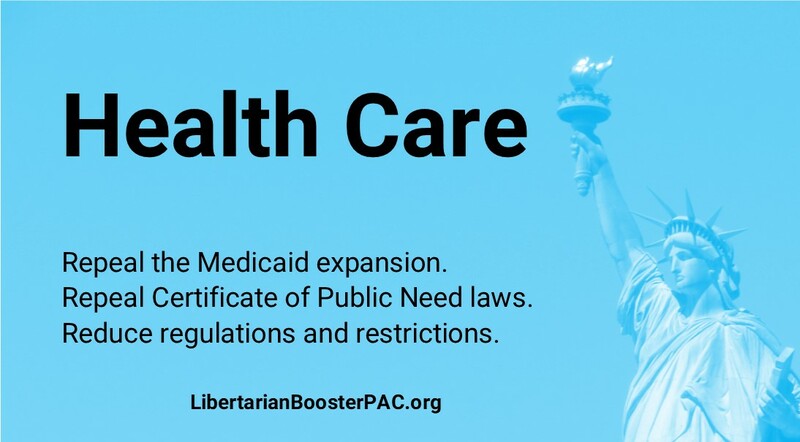 In 2018, they passed laws to expand Medicaid eligibility. That increases federal spending on Medicaid (which increases the burden on all taxpayers, including Virginians), and it also increases state government spending on Medicaid. It’s a double blow to Virginia taxpayers. We support the repeal of that expansion. Currently, Medicaid spending is around one-fourth of Virginia’s total budget. We want to cut that by at least 10%, as part of our proposal to cut spending 10% across the board. Another change that can help health care in Virginia is to repeal Certificate of Public Need (COPN) laws. Many people are unaware that, if a healthcare provider wants to offer or expand services, it first has to prove to the state that the services are economically necessary. (Can you imagine having to prove that before you open a new restaurant?) The real purpose of these laws is to squelch competition for existing healthcare providers. When you limit competition, you limit choices and drive up costs. We need to get rid of these laws. Getting rid of other regulations and restrictions will also be helpful. Removing barriers to telemedicine will make it easier for patients to get help with minor problems at a lower cost. Repealing restrictions on which insurance policies people can buy will reduce costs and improve competition. In 2018, the General Assembly passed House Bill 5002 to expand Medicaid eligibility.